You may not know it, but Fantasy Flight Games, well known for epic games with extremely high production values, actually has a line of lower-cost, fast-playing small box games. 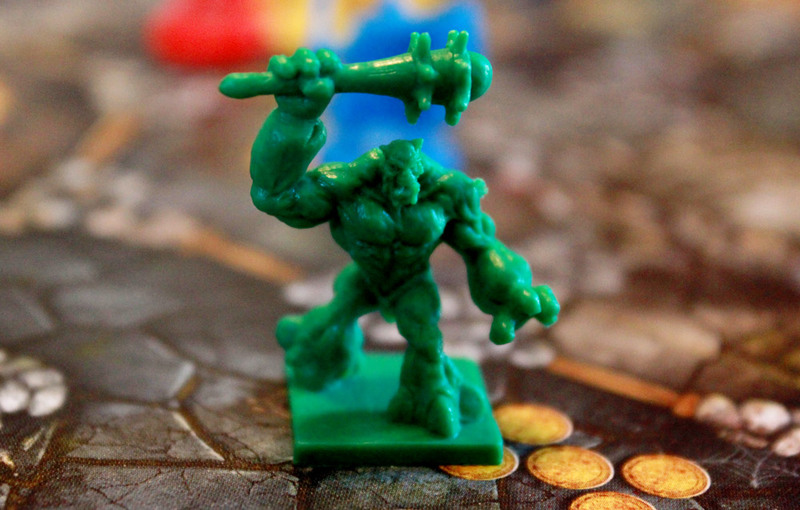 The second edition of Cave Troll by designer Tom Jolly is one such game in this “Silver Line.” A somewhat abstract game featuring area control, Cave Troll has heroes fighting monsters and other groups of heroes for the most gold-filled locations in the cave. So, is this a cave worth exploring? 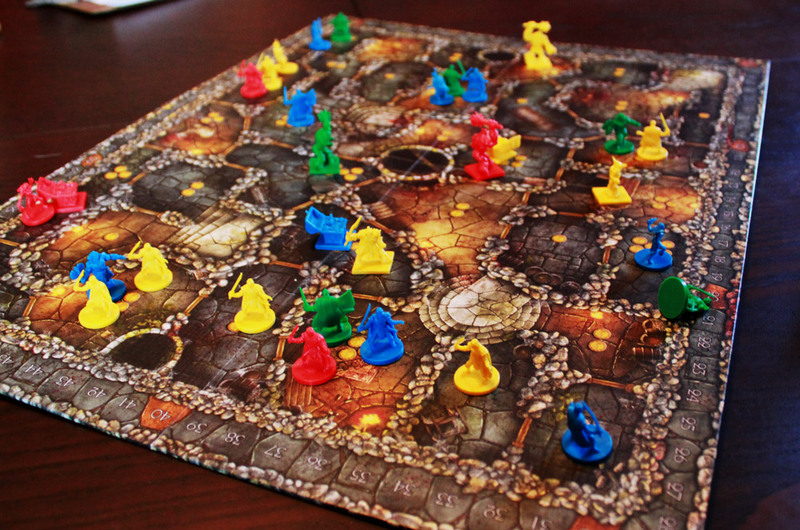 Cave Troll takes place on a small board divided up into areas with varying amounts of gold. 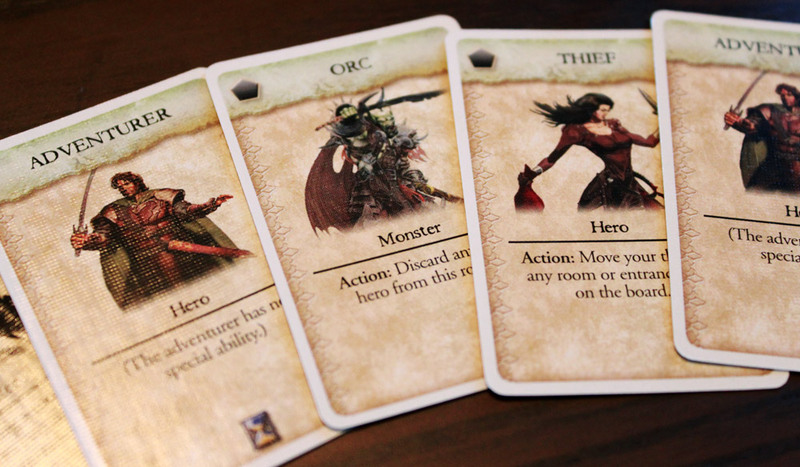 Each turn, players have four actions to place new heroes and monsters, move them around, use special abilities, and play certain special cards. Players have a deck of cards with which they can add heroes to the board and gain a few other special actions. Welcome to the (crowded) cave! There’s no rolling of dice, but the characters function in a sort of “rock-paper-scissors” relationship. Adventurers are numerous but have little else going for them; Orcs can kill any heroes except Knights, Knights can kill Orcs. Wraiths push heroes into another room, while Thieves can move anywhere on the board. The Dwarf doubles the gold value of a room, and the Barbarian counts as two heroes when determining who controls a particular room. Finally, the mighty Cave Troll clears out a room when placed and blocks off that room for the rest of the game. There’s also a treasure chest, which adds to the gold value of a room, and a few powerful artifact cards. Points are scored every so often (indicated by icons on the cards), and points are awarded based on controlling rooms. To control a room, you have to have the most heroes in that room (monsters, even your own, do not count). The game ends when one player runs out of cards in his/her deck. Cave Troll is a pretty simple, straightforward game. Nothing particularly special, but it’s functional, balanced, and enjoyable. It doesn’t take long to learn or to play, although the overall strategy is hard to grasp right away. It feels a little bit like it should be a combat game—after all, your heroes have swords and axes and there are monsters. In fact, one reviewer on Amazon lamented that you don’t even get to fight the Cave Troll. Well, it’s true, the Cave Troll is just one piece on the board, and you don’t get to fight him. But that’s because this isn’t a combat game. It’s an abstract game in disguise as a dungeon adventure. I like games with theme, and a dungeon delve is as good a theme as any; but if you get too caught up in it, it doesn’t make any sense why your sword-wielding Adventurers can’t fight Orcs (or other players’ Adventurers), and neither can the Barbarian, Dwarf, or Thief. But if you get past that, it really is a clever little game of strategy. You can fight for the big areas that offer five gold, or you can try and spread your adventurers out to as many one- and two-value rooms as possible. You can send the Orc around to kill adventurers, but you can only do so much in so little time, and you’ll need heroes of your own to control rooms and score points. The way hero and monster placement works is also interesting. You need to play a card from your hand to add a hero, but you only have one card in your hand. When you play a card, you first draw one card, then play one of the two cards in your hand, so what you actually get on the board is pretty subject to luck. If your Cave Troll happens to be the last card in your deck, it’s not going to do all that much (although having it be first might be worse—no one will be out in force yet, so you’ll either have to pick a random room to block or just have to blindly pull out more cards to play). Still, you do what you can with what you’ve got, and since most of your cards (and heroes) are Adventurers, you’ll spend most of your time jockeying for position. What is interesting is that you control heroes and villains, not one or the other, and while monsters are more “attacky,” they don’t help you control rooms, and they also attack your own heroes automatically if you maneuver them poorly. The game only takes about forty-five minutes to play, and it’s easy to set up. It also includes a set of alternate cards that give the [non-adventurer] heroes and monsters different abilities, including a crazy rampaging troll that can actually move around, so there’s a little replay value there. The production quality—even though it’s a “Silver Line” game—is still Fantasy Flight level. The board looks like a deep, dark, monster-infested cave, and your heroes and monsters are of course represented by villains. However, the plastic is a bit cheaper than their standard “big box” games—for the minis it doesn’t really matter, but the player scoring markers are flimsy and light and easily knocked off the board. Speaking of which, the board is tiny, and mine at least did not stay very flat when unfolded, which certainly didn’t help with the score tokens staying in place. The cards are also mini-sized, but they clearly state the necessary information, the art is solid, and the cards aren’t the central part of the game anyways. It’s definitely a “cheap” game, but a cheap Fantasy Flight game is still miles ahead of much of the production quality out there. 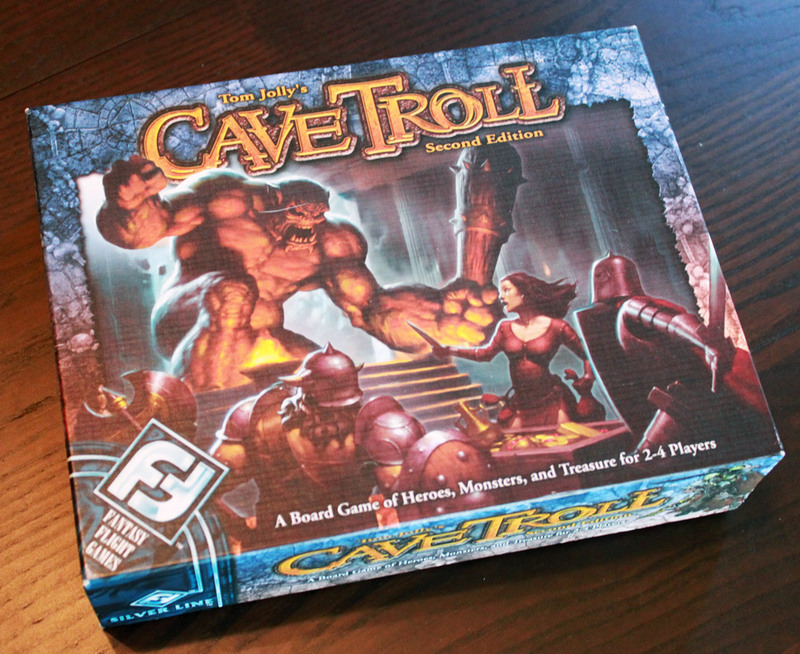 All in all, Cave Troll is probably best served as a “filler” game. It’s fast and easy to set up, offers a bit of strategy mixed with a bit of luck, and looks nice, but it’s not really the game people are clamoring to play. Fortunately, it’s fairly inexpensive and doesn’t take up space, so it might be a worthy addition to your collection. It’s also worth noting that it works well with two players in addition to three or four. Many games suffer in the two-player region, but this one remains strategic, tense, and interesting. As long as you know what to expect. Cave Troll, surprisingly, is a game I don’t hate. I don’t love it, mind you, but it is much better than expected. So I approached Cave Troll with great prejudice and editorial distance. The name—an entire game based around a Sean Bean line? The aesthetic—a dark dungeon with too much fantasy adornment? And that’s why it was so surprising that I didn’t hate it. Cave Troll takes the area control game, simplifies it, adds enough twists and flavor to keep it interesting, and doesn’t overstay its welcome. While it’s not my favorite, it’s certainly not a bad game, nor is it one that I’d likely refuse to play. As @Futurewolfie mentions, it’s best to think of Cave Troll as more of an abstract game than a dungeon crawl. 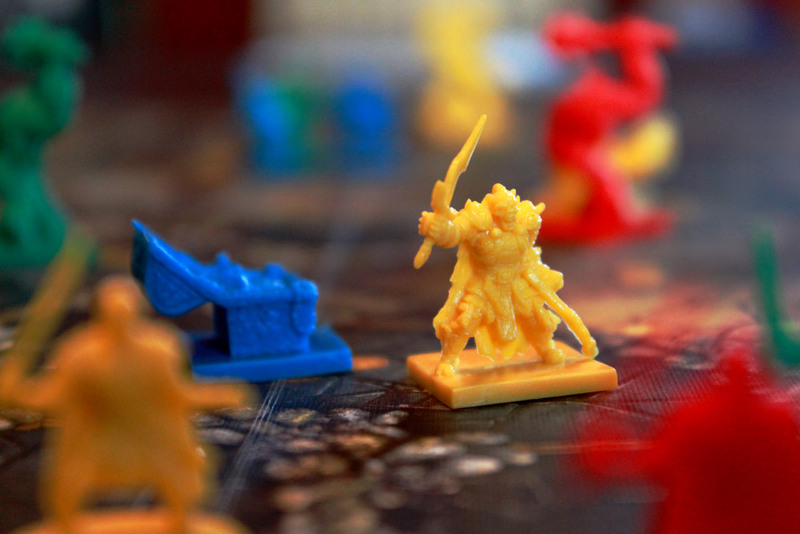 Players are trying to maneuver their pieces to collect the most loot while also hindering their opponents’ pieces. Cave Troll is abstract in theme, but it is also heavily controlled by luck, which is unlike my experience with most other abstracts. A deck of cards dictates the characters a player can bring on the board, so it can be frustrating to draw Adventurer after Adventurer while your opponent draws all his cool stuff. Then again, knowing that an opponent’s cool stuff is already on the board means that his deck won’t be as good as the game progresses, whereas yours increases in potency. The draw-one/play-one manner of placing pieces on the board is interesting, but it doesn’t take long before you realize that there’s not a lot of long-term planning within a player’s control. Holding the Cave Troll may seem awesome…until you’re faced with the choice of placing him or your Knight, when really you’d rather just place another Adventurer. But really, this isn’t too bad. All players are forced to make these same kinds of decisions, and it’s okay to play a game that’s heavier on the tactics side every once in a while. There’s one thing I can never complain about with a Fantasy Flight game, and that is the components. They are, as usual, nice, though the scoring tokens are pretty cheap and the art is not my style (but hey, like I said, I am not Fantasy Flight’s audience, so take what I say with heaping tablespoons of salt). Cave Troll is a diverting (and even pretty fun) game that’s big on luck, but offers enough interaction and laughs through the area control to keep it interesting. It’s not a game I would suggest to play often or seek to add to my collection, but I’m also not disappointed a nearby gamer has it in his. I can’t say the same about some other Fantasy Flight titles (…). Previous ArticleFDQ: What Do You Play to Relax? Good review guys. Cave Troll is a simple game the surprised my in how much I enjoyed it. But I’m curious how many times you have played it? I’m a little surprised that neither of you spoke about one of the biggest choices in the game; When to play scoring cards. You glossed over the scoring cards in the “How It Plays” section so fast, I don’t think people unaware of the game would realize how important this aspect is. Some of the cards have 1 to 2 hourglass icons on them. These cards go into a special discard pile to keep track of the number of hourglasses played. All rooms are scored every time the total number of hourglasses hits 5. Players also have a card in their deck that allows them to score 1 room when played. Choosing when scoring happens can make a big difference in the end total. Most of my plays have been 2 player. So it may not be as important with more. You’re right: the hourglasses do offer additional strategic choices for scoring rooms, though I do think this possibility is lessened with more players. Most of my games have been with three or four players, and it didn’t seem to be a huge area for strategy, considering that three turns go by before you have a chance to add to the “timer,” and as I mentioned, if you are holding a card for later use, you may not have as much control over the timer anyway. But thank you for pointing this out: it is an omission in our review.